Tory austerity policies may actually be killing people, according to a landmark study. The government has been accused of “economic murder” after researchers linked hundreds of thousands of deaths to cuts to public services that began seven years ago. According to joint research between Oxford, Cambridge and University College London, there have been 120,000 deaths since the Conservatives gained power in 2010. Although falling short of claiming a direct cause and effect, the study found there were 45,000 more deaths than expected between 2010 and 2014. It claimed that at this rate the number could reach more than 150,000 deaths by 2020. In other words, Tory policies could claim up to 100 lives per day. 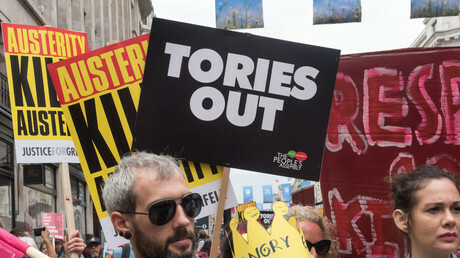 One of the study’s co-authors, Professor Lawrence King of the Applied Health Research Unit at Cambridge University, said: “It is now very clear that austerity does not promote growth or reduce deficits – it is bad economics, but good class politics. The research found that the decline in social care funding from an annual 2.20 percent to 1.57 percent coincided with a decline in death rates from 0.77 a year in 2010 to 0.87 percent. The Department of Health stressed that no direct association should be made. A spokesperson said: “As the researchers themselves note, this study cannot be used to draw any firm conclusions about the cause of excess deaths. Shadow Health Secretary Jonathan Ashworth said the government must endorse Labour’s spending pledges in the Autumn Budget. Responding to the study, he said: “This shocking mortality gap is a damning indictment of the dire impact which sustained Tory cuts to our NHS and social care services have had on health outcomes across the nation. “Ahead of the Budget, this appalling news must serve as an urgent wake-up call to the prime minister,” Ashworth added, according to the Independent.